A shocking video has emerged of the moment a man became engulfed in a ball of flames after his mobile phone battery caught fire in his pocket. 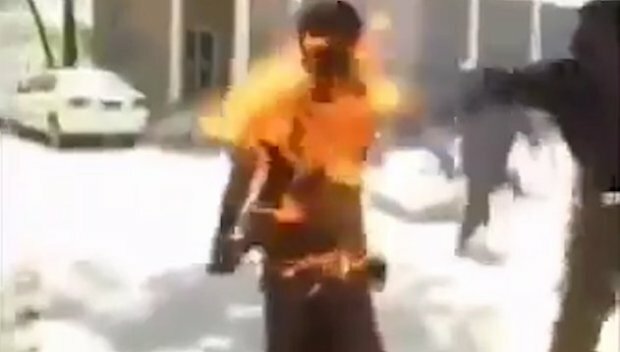 The incident, in Pakistan, was captured by a witness who caught the horrifying scene on camera as the man frantically tried to put out the flames. At the beginning of the clip, the man can be seen casually walking down a road after getting off a bus. At first he does not appear to be aware that his pocket has caught fire. The flames quickly spread up to his arm and engulf his shirt, sending him running and screaming in pain as he turns into a ball of fire. Horrified bystanders attempt to help him put out the flames, with one man striking him with a rug in a bid to stamp out the fire, but to no avail. A local market worker then threw a large bucket of water at the man and after a second attempt at dousing the flames, he finally managed to extinguish the fire. The video concluded with the man stumbling towards the camera while struggling for breath. His condition is not yet known following his ordeal. In another incident, a woman named Anna Crail was flying to Honolulu, Hawaii from Washington when her iPhone suddenly erupted into eight-inch flames. It dropped underneath a seat as passengers scrambled to safety.